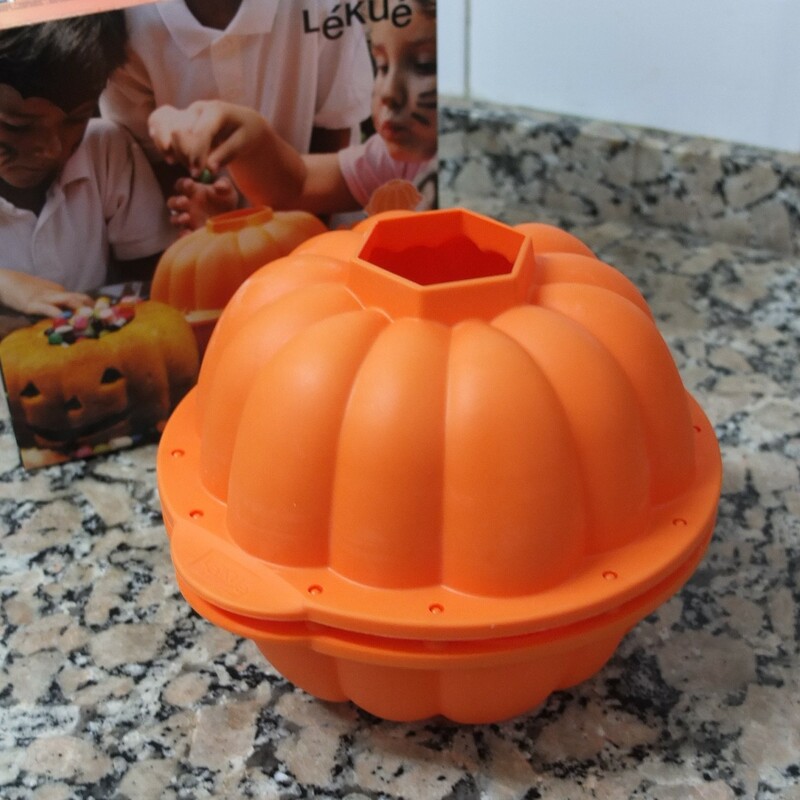 Would you like to make a cake that looks like a pumpkin? Um.. who wouldn’t?! lol. It’s a delicious cake, very moist and tangy. A perfect autumn cake, it was my contribution to a Halloween climbing weekend and could be an amusing centrepiece at some Thanksgiving table. 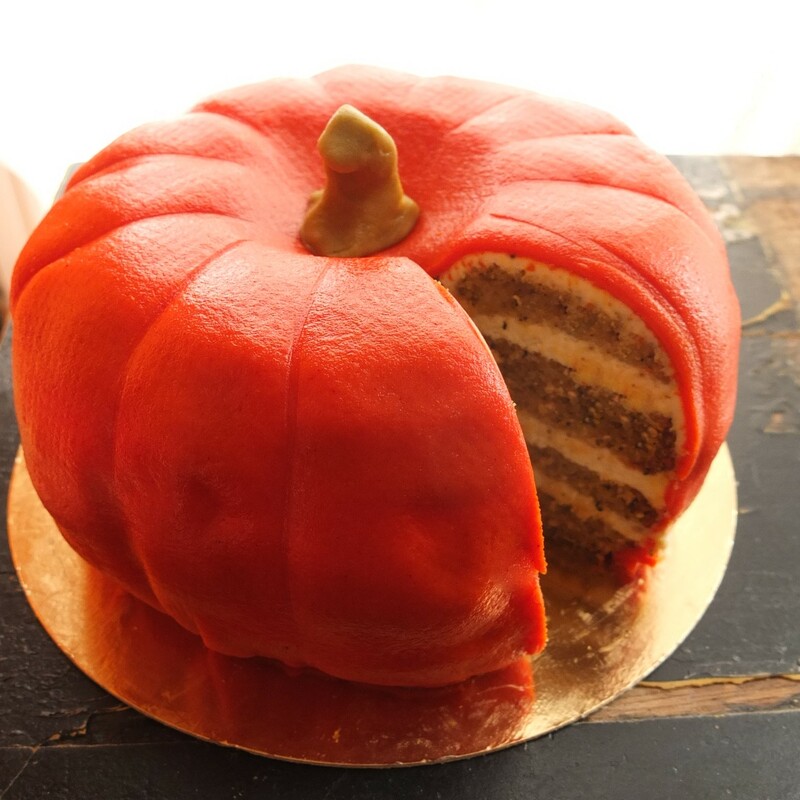 A word of warning, it doesn’t have the typical spices because the tangy lemon and Earl Grey tea flavours lighten the homemade pumpkin purée in a sponge made with some unrefined light demerara sugar. The ricotta and Philadelphia cream cheese frosting is also flavoured with lemon juice. Finally, the cake is covered in a thin layer of orange marzipan. A Canadian climbing friend said it was a pumpkin cake with an identity crisis! Poor thing. That’s why I’ve called it a faux (fake) pumpkin cake. But she did say it was delicious and moist. So I suggest that early on you squash any expectations of a pumpkin pie in cake form. Luckily all my other friends of various nationalities were in blissful ignorance of the pumpkin spice heaven they were missing out on and just found this cake absolutely scrumptious! 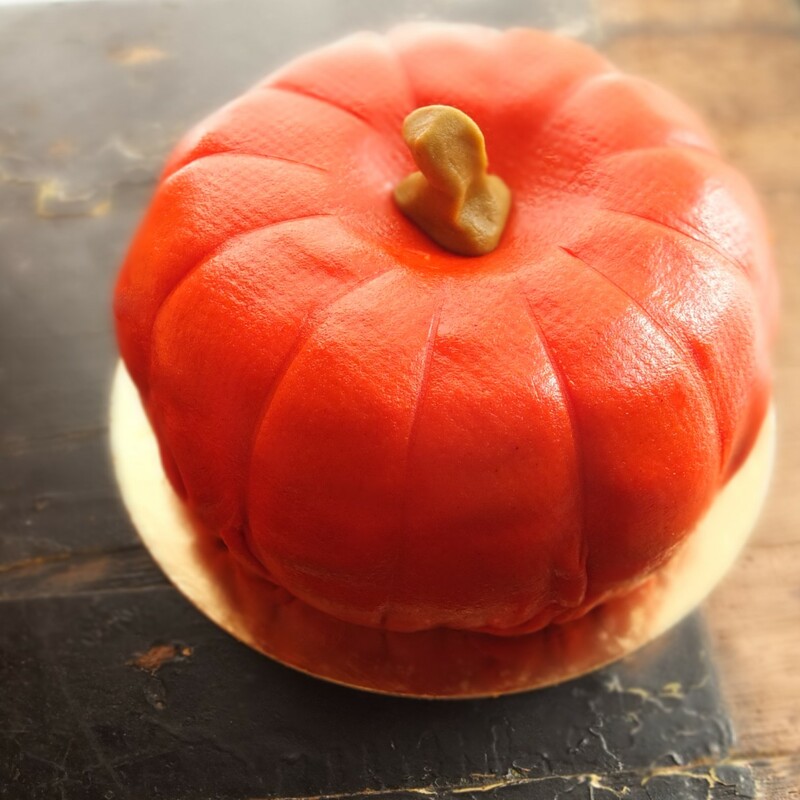 Pretty attractive too… But even if you don’t have the special Lékué pumpkin mould you might like to make this cake! Like many people obsessed with baking (hello there!) I seem to be collecting an amazing number of cake moulds, kitchen appliances and ingredients. Many of these are now housed in my large bedroom cupboard (um, wardrobe) because I ran out of space in the kitchen. Ahem. Don’t tell anyone. Anyway, a few days before Halloween I was walking by a cookery shop window after teaching my class of particularly adorable children (they keep asking me for homework, which is a bit strange). So it’s not as if I needed shopping therapy to make me feel better. But when I saw this pumpkin mould I just had to go in. No-one was in the shop and the door was locked. You’d think I’d take that as a sign: ‘Don’t buy any more cake moulds Lili!’ But I dithered by the door a little while longer and assistance arrived with a key. Hurray! What convinced me was when the shop assistant explained I could also split the silicon mould to use half as a smaller bundt tin all year round. Perfect. Sold. In a mere 30 seconds. Off I toddled home to make a pumpkin cake, which I’d never ever made before. By the way, you can admire this mould and see photos and reviews on Amazon here. You may be tempted to buy one too. Totally understand. Now, where to get pumpkin purée in Barcelona? Apparently the canned stuff is really good. But where could I find some? Some supermarkets stock American marshmallows and popcorn here now but there are still limits to what globalisation has achieved. I was inspired to search the Taste of America store website. They’re not far from my flat but they’d completely run out of canned pumpkin purée. Hoards of Americans must have raided this one Barcelona store of US goodies. Then I checked on Amazon – the cheapest tins were out of stock and I baulked at spending 19 euros on postage and packing for a 4 euro can. I had my finger ready to press the order button but just couldn’t do it. It was slowly dawning on me I should probably buy a pumpkin and make my own purée. Sigh. This was going to be a bit of a cake odyssey. 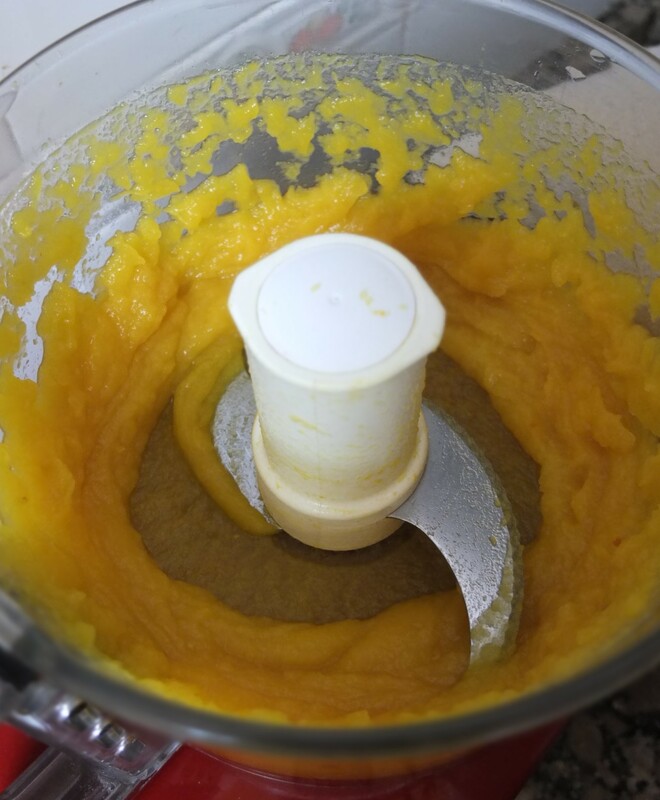 More online searching revealed the easiest and most highly-praised 5-star pumpkin purée recipe in cyberspace. And a search of my kitchen drawers turned up the essential scary chopping knife (as starred in gory action and horror movies). Muahaha. For the original recipe please go to Pumpkin Puree by Alton Brown. The beauty of his recipe is that you just split your pumpkin in half, sprinkle some salt on the flesh, put in the oven at 200°C/400°F (convection, static oven) or 180°C/350°F (fan-assisted). Bake for 25 to 45 minutes (depending on the size of your pumpkin) until a skewer (or peeler) goes in easily into the soft flesh. Then scoop out the soft baked flesh, thus avoiding all that painful earlier chopping of tough uncooked pumpkin into pieces. Finally process or mash. The pumpkin purée was so delicious I was tempted to heat it up as a lovely soup on the spot. I could just forget the whole pumpkin cake palaver. But no, I was determined to make it. As anyone who knows me a little would guess. Make the ricotta and cream cheese filling/frosting the night before so it can firm up (500g/17.6oz fresh ricotta – drain first for a few hours then scrape through a sieve to give you a smooth cream. Then whisk in: 110g/3/4 cup + 2 tablespoons icing/powdered sugar, 200g/7oz Philadelphia cream cheese at room temperature, 1/2 teaspoon pure vanilla extract to taste, 2 teaspoons lemon zest, 2 teaspoons freshly-squeezed lemon juice). Cover the bowl in plastic film and store in the fridge. Lightly grease your moulds with butter and flour. Place three rounds of grease-proof baking paper over the hole in one of the half-moulds, so the batter doesn’t run out. Whisk the eggs and sugar (brown and caster) until thick and pale, at ribbon stage so it falls um.. like a nice thick ribbon. Whisk in the lemon zest and lemon juice. Whisk the dry ingredients (flour, baking powder, Earl Grey tea and salt) in a medium-sized bowl to combine. Very slowly stir in the oil into the eggs and sugar. Don’t overmix. Very slowly stir in the flour and other dry ingredients. Don’t overmix. Very slowly stir in the pumpkin purée. Don’t overmix. Pour in your moulds and bake 40 to 60 minutes depending on your moulds and oven. Do not open your oven door for the first 40 minutes (unless it looks like your cakes are getting too brown). When you insert a skewer in the middle and it comes out clean your cakes are ready. The top should also spring back when you press down lightly with your finger. Make the lemon soaking syrup. Bring the maple syrup, water and lemon juice to the boil. Take off the heat, pour into a bowl and allow to cool. Also cool your cakes completely on a wire rack before assembling the pumpkin. Slice the two cakes into layers horizontally. Use DVDs or books of an appropriate height on each side, to guide your serrated knife as you cut. Make a vertical mark with some flour up the side so you can remember how the cake is positioned. Place the bottom cake layer on a cardboard base or plate. Brush the cake layer with 1/4 of the lemon syrup. Pipe a layer of ricotta on top. Place the second layer on top and repeat step 4. Repeat this process until you have the top layer of cake, which you brush with syrup but on the underside (not on top). Spread a thin layer of ricotta cream all over the cake to help stick the marzipan layer on. Colour your marzipan with orange (mine was a little too strong!) and knead it in so it’s even and flexible. Roll out the marzipan thinly (about 5mm or less) on baking paper lightly sprinkled with icing/powdered sugar. Rub the extra sugar off with the palm of your hand. Place the marzipan carefully over your cake and press down with your hands to eliminate any air. Cut around the bottom with a knife, making sure you leave enough marzipan to tuck in and cover the lower pumpkin and make it neat. 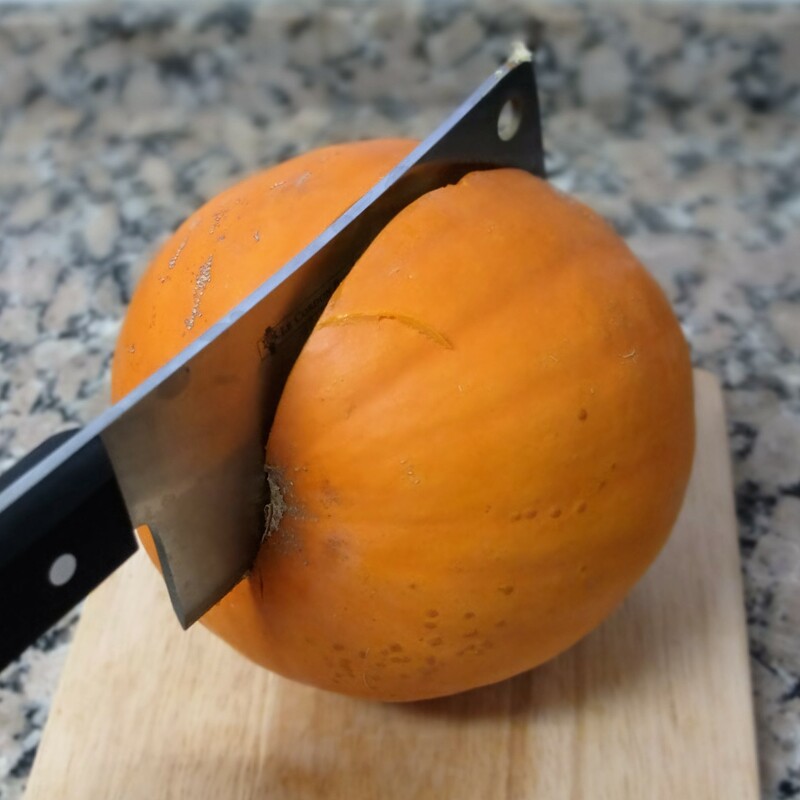 Use the back of a butter knife to mark and emphasize the grooves along the pumpkin. Make the stem with some extra marzipan coloured with beige or a mixture of colours that will give you a kind of brown. This cake keeps well in an airtight container in the fridge for up to 4 or 5 days. It also keeps very well if you want to wrap individual slices tightly in plastic film (so there’s no air between the plastic and cake) and place in the freezer up to 2 weeks or 1 month. And it travels well. The climbers enjoyed it as a pre-halloween treat out at the rock. Here’s some of us cheerily posing with our slices. 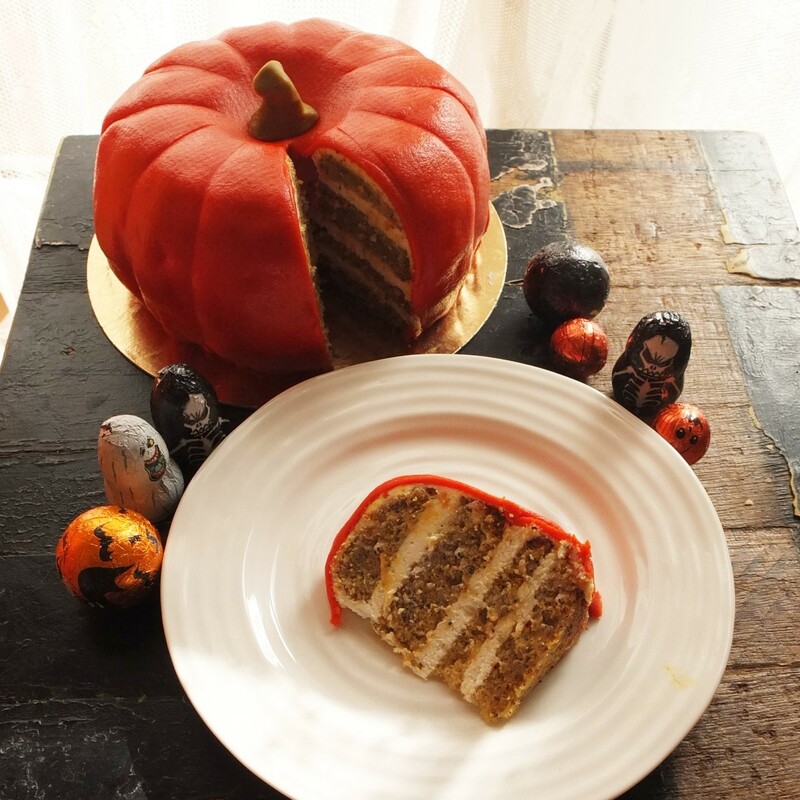 So sweet reader, I hope you’ll have a slice of faux pumpkin, lemon and Earl Grey tea cake too! Hello Lili! 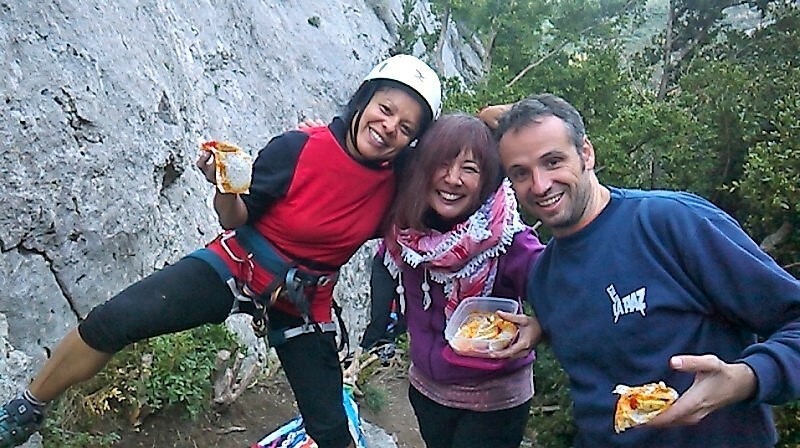 Your climber friends are very lucky because they usually taste your splendorous recipes. 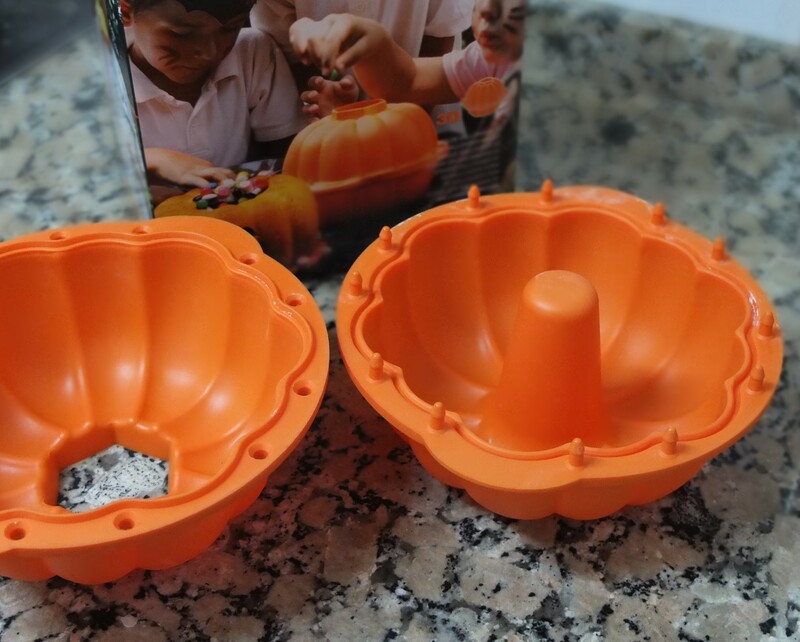 For me, is not strange that kids want homework because I guess they love your class, so they want to continue their kitchen activities at home 😉 I love how the pumpkin cake looks with that lovely mold. It also sounds (reads) and looks delicious. The inside look (with those layers of light brown and cream color) is like a lovely surprise wraped by that shiny orange marzipan Mmmm! Have a great week-end! that flavor combo sounds ridiculously good!! especially because i love everything earl grey (: and the marizpan covering reminds me of princess cake (white cake, kirsch custard, raspberry jam and marzipan).